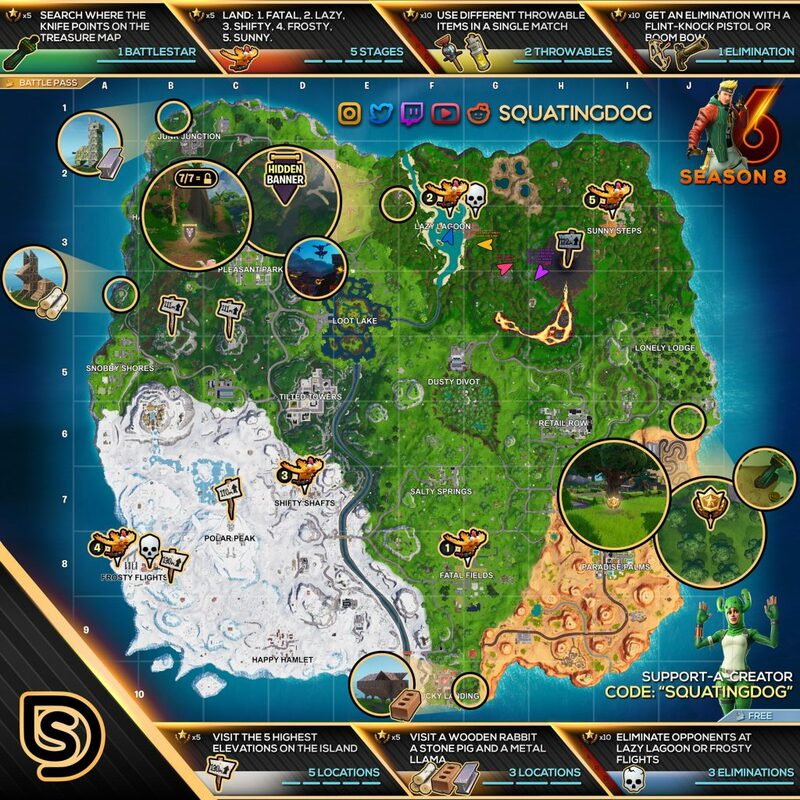 The Fortnite Season 8 Week 6 cheat sheet has been released. The week 6 cheat sheet will help you complete all of your week 6 challenges. All week 6 challenges will be available to complete beginning on April 4, 2019. Like previous weeks, this weeks cheat sheet will cover how to complete the 3 free challenges, and 4 battle pass challenges. In total, by using the sheet to complete your challenges you can earn 50 battle pass stars to help you rank up your battle pass. This weeks challenges are pretty straight forward and should be quite easy using the season 8 week 6 cheat sheet below. In addition to helping you with your week 6 challenges, this cheat sheet includes this weeks battle star location. The riddle to help you find this weeks battle star is “Search where the knife points on the treasure map loading screen” – or in other words slightly North of Paradise Palms. Keep in mind you will need to finish the match to complete progress on your challenges. Quitting at any point during the match will not count towards your challenges.